1. Cut out an ornament shape with a notch on top from the egg carton lid. 2. Using the other half of the lid, cut out a rectangle shape just smaller than the ornament piece. 4. Wrap both pieces of styrofoam in duct tape, leaving the hole in the circle open for a photo. 5. Tape three sides of the rectangle to the back of the circle with the notch at the top. You can slide your photo in through the open (top) side when you are finished. 6. 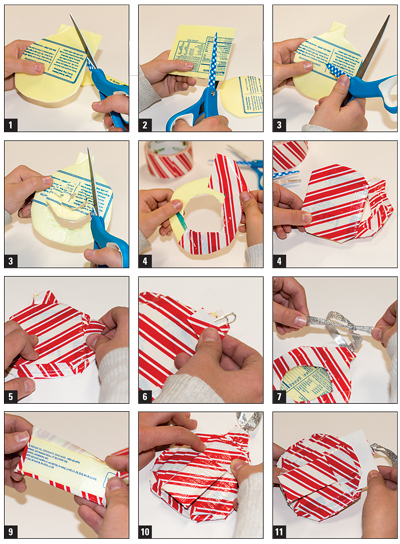 Tape the paper clip onto the back of the ornament halfway sticking up at the notch for a hanger. 7. Put a ribbon through the paper clip to hang on your tree. 8. To display the frame on a table, cut a piece from the lid that is about an inch wide and a little shorter than your frame. 9. Wrap this piece of styrofoam in duct tape and bend it over about one inch down from the top. 10. Tape the bent portion to the back of the frame. This way your frame can hang or stand. 11. Size your picture and slide it into the frame. Next article…and to All a Good Sweet!